Waste is a deliciously ambiguous notion. What is discarded and not used in the venture is waste. Food that is not digested. But waste is also a mark of prosperity. Where much is being done there is waste. Little being done, little being scrapped. So waste is a product of achievement. For those who acquire wealth and status, waste is the sign of prosperity. The man who leaves food on his plate is not suffering adversity. Only the destitute waste little. An army of media viewers devour photos and stories of excess among the rich. 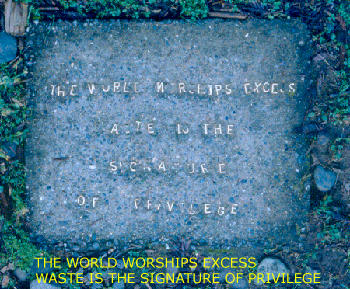 Waste is the signature of privilege. It is the measure of prosperity. Even the fountain of invention. The first two lines are inscribed in the stepping stone shown. To live in carefree luxury, to be released from the care of ‘waste not’, is the fantasy of many. That release is what allows play. Purposeless effort without concern for waste – play – is what brings us invention. As well, it may bring us destruction. he finds how much it’ll do. until he finally shatters it. drives it through to uselessness. that’s the fountain of invention. Of what do people dream? What is the most sought-after thing? Answer: well being. Freedom from want. To live in plenty; to not worry about hoarding scraps; to have enough on the plate that you needn’t eat it all; to play instead of to work; to have leisure; to have time to waste. People who know luxury needn’t concern themselves with small matters. They are freed by wealth from attending to trivia. But though this may appall the puritans, there is, in this freedom, a hidden treasure. It spawns art and music, culture and literature and science. Because, among those who use their gift for play, there are others whose play is the passion of productiveness. They use their well being to produce works of science, engineering, music, literature and art. It is freedom from want that lets them do it. Creating demands attention; attention not spent on mere survival. In short, the tolerance of waste is precisely the engine of productivity. It is what lifts the material wealth of both rich and poor.